The passage from II Chronicles, depicted below, was very popular amongst Christians back in the 70s when we were celebrating the country's bicentennial. To commemorate the US National Day of Prayer I thought that I would offer a few comments concerning this passage. My People: Many believers point to atheists and others for the secularization of America. This passage seems to indicate otherwise. My Name: It is to God we are called and to Him we must answer for the state of our nation. Humble Themselves: The image that many see in believers is often anything but humility. I am so opinionated and so in need of humility. Pray and Seek: I sometimes forget how these two things go together. I think that we can determine the depth of our humility by the amount of time we spend praying and seeking. Turn: It is so easy to point a finger of repentance at other people. The heart of this verse is that we would turn.. that we would repent.. that we would change. 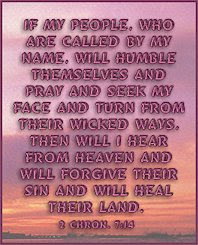 I love how God responds to humility, prayer and repentance. He says that He will hear, He will forgive, and He will heal. Please join me in prayer for America and other countries.